Learn about Clearasil® acne care. Dermatologist-tested products & articles show you how to have clear skin and battle acne one breakout at a time. 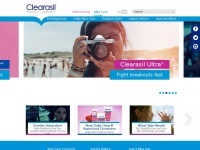 three profiles were found for Clearasil.us in social networks. Among other social networks the website is represented in Facebook, Twitter and YouTube. The web server used by Clearasil.us is located near the city of Dublin, Ireland and is run by Amazon.com. The website Clearasil.us has a own web server. The web server only runs this website.